ZackOur Zack and Zoey Fleece-Lined Hoodie in Black is for dogs looking to enhance their basic hoodie with extra plush warmth. Now your pet can enjoy the same warmth and comfort that you do in your own hooded sweatshirt with this Fleece-Lined Dog Hoodie in Black. This hoodie features a cotton hoodie shell and a polyester thick cream-color fleece interior, duplicating the popular human apparel trend. 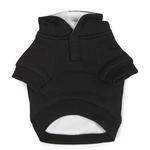 The ribbed sleeves and waistband ensure the cold gets locked out and keeps the warmth near your pet's body. 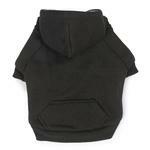 This dog hoodie features a touch fastener placket at the neck to make it easy to put on and take off. This dog sweatshirt is perfect for chilly walks and for making winter potty breaks much more pleasant. The handy kangaroo pocket is great for stowing away a treat or a waste bag. 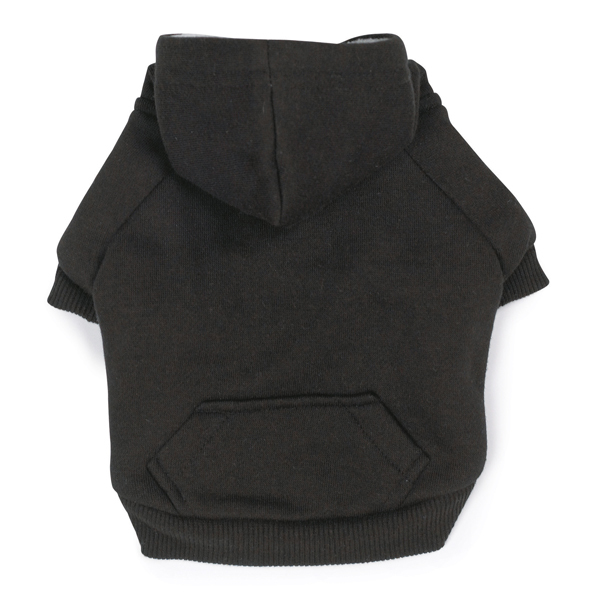 The black color is a great choice to hide grime, but when your dog's hoodie needs cleaning, it is machine washable with a 65% cotton 35% polyester blend. Line dry. Fleece Lined Dog Hoodie by Zack & Zoey - Black Customer Photos - Send us your photo! Right after a walk in cold, cold New York. Sitting on Top of the sofa- his favorite place!!! So comfy- he even likes to keep it on while lounging around at home! IT'S COLD AND WET...BUT IM WARM AND DRY!! I won't be shivering this fall thanks to my new hoodie from Baxter Boo! Mann prefers his hoodie "un-velcro'd" sporting the V-neck look! Hoodie is well-made, true to size, but my dog has a rather big chest and I should have purchased a size larger to give him extra room, my mistake though. Received great service, fast delivery and nicely packaged. I would highly recommend this item if anyone is considering purchasing. Posted On 08/16/17 by Janette R from Noxapater, MS Yes, Janette R recommends this product! I love this hoodie. I don't have to double her hoodies anymore. Well made and just the right size. Posted On 01/22/17 by Fred T from Lowell, IN Yes, Fred T recommends this product! nice double layer/looks to be a real warm pullover hoodie for cold days. Posted On 11/14/16 by Richard L from Chicago, IL Yes, Richard L recommends this product! Posted On 10/26/16 by Barbara T from Rochester, NY Yes, Barbara T recommends this product! I love this hoodie,very well made,fits perfectly,worth the money! Posted On 10/11/16 by Amber R from San Diego, CA Yes, Amber R recommends this product! I bought this in a small for my 5 lb Morkie and it fits well. There is a little bit of room but will probably shrink a little in the wash and fit perfectly. I like that it is long and covers him all the way to his tail and the fleece lining is very cozy. I will probably buy in another color as well. Posted On 04/12/16 by Stacey H from Cincinnati, OH Yes, Stacey H recommends this product! My puppy loves his new hoody and it looks great on him!! So happy with this product! Posted On 02/20/16 by Kathleen R from , Yes, Kathleen R recommends this product! Essential Hoodie to keep Warm!! Posted On 01/07/16 by Emma M from Alhambra, CA Yes, Emma M recommends this product! 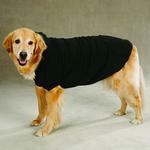 This hoodie is great to keep your pup warm because of the fleece. I am thinking of buying more colors!! The only thing that concerned me was trying to get my dog's arms in and out, he has long arms. Other than that, we LOVE this hoodie!!! Posted On 11/10/15 by Ashley C. from Baltimore, MD Yes, Ashley C. recommends this product! Posted On 09/28/15 by Nadine J from Whitesburg, GA Yes, Nadine J recommends this product! So perfectly great, ordered a red and a black. The fleece lining underneath the thick cotton exterior makes this our #1 winter hoodie. Not only does she stay warm, it looks fabulous! I like the velcro neck opening for having options (inside/outside). The hood fits right so for wet weather it's a plus. Stays on my dog - which is difficult because she is so slippery. It's hard to keep many sweaters on her. If your doggy must endure long, cold winters, buy several of these in multiple colors. You'll be so glad you did. Posted On 02/22/15 by Mary C from Toms River, NJ Yes, Mary C recommends this product! Easy to put on, warm & soft. My Shih Tzu doesn't mind wearing this at all & sits nicely while I dress him. Posted On 01/29/15 by Allison B from Whitehorse, Yes, Allison B recommends this product! The hoodie is fleece lined and made very well. It fits large so it is a good layer piece over another sweater. Even fits my stocky pit bull! Posted On 12/13/14 by LoveThyPitBull(dot)com from , CT Yes, LoveThyPitBull(dot)com recommends this product! Anyone who has a husky pit bull knows that getting a 'sweater' or coat for them is next to impossible. I bought this in XXL for him and while it is too long for him (goes past his tail and his man parts) it does fit his chest and thats usually his trouble area (we have this in common, lol). I plan to alter the length so that he can wear it and relieve himself without me worrying he will pee on his coat. But this is really well made and just a super nice hoodie. He looks quite handsome in it too. Excellent customer service and handwritten note on packing slip just makes you feel like BaxterBoo really does 'care'. lol. Posted On 11/23/14 by Lorraine R from Gig Harbor, WA Yes, Lorraine R recommends this product! Love this but large was too big. I have already ordered medium and anxiously waiting for them. Nice and warm. Very nice looking.